2016 Reading Challenges · What Will I Be Doing? Every year, I do one reading challenge: the Goodreads one, where I set a goal of 100 books to read for the entire year. This year? Not only will I participate in that, but I will unofficially participate in various 2016 reading challenges hosted by some lovely bloggers. What are those challenges? 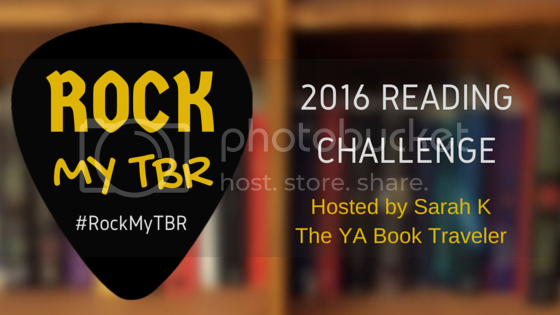 Rock My TBR, hosted by Sarah of The Book Traveler, aims to get readers to read books they already own. It seems like a no-brainer that I will participate in this reading challenge because I have soooo many books on my bookshelves that are still unread even though I’ve got them years ago. This challenge is an absolute must. The goal: To read a minimum of 1 book per month. I think I can do it. I should really make a list of all the books I own because it would be easier to figure out what books I want to tackle. Backlist Books, hosted by Pretty Deadly Reviews, asks that you read books that have been published in 2014 or earlier. These days, all everybody seem to talk about are the books that are currently coming out, and that is fine and all, but we gotta give love to those pre-2015 books! Lately, all reviews and books people talk about seem to be about new/upcoming releases, but where are the reviews about old books? I vow to read a pre-2014 book each month because I gotta show them love. We are so ARC and new release-orientated these days, so I want to go back to the old ways—reading and reviewing old titles. It’ll be fun! This will give me the chance to read old titles that I’ve been reading to read. The goal: Get all the challenge categories marked off! I had been looking for a comic reading challenge, and this one by Panels seems really awesome. I love that it isn’t about making a dent to achieve reading a certain number of comic books you set for yourself; it’s to get you to find new awesome comics you’ll love or hate. That’s what I want to do! I’m pretty sure there’s another reading challenge I wanted to participate in, but I just can’t remember it. I think participating in four challenges (including the Goodreads one) is quite manageable. I don’t want to make a full commitment since I know things easily change (like mood reading and other responsibilities in my life). Besides these reading challenges, I have a list of goals I want to achieve in 2016 as well (which you will see a post on January 1st), so I don’t want to pack my list with too many challenges. Are you participating in any reading challenges? What are they? These look like awesome challenges! I’m really excited to decide what challenges I’m going to do next year, but it’s hard because there are so many to choose from! I may have to check out Rock Your TBR. Sounds like something I could really do because I reeeaaallly need to work on my own personal TBR instead of review books. Good luck in your challenges! I was only going to do 2 – but who am I kidding – I’m up to 4 and it’s only the fact that I’m developing a very involved spreadsheet that is keeping my mind and hands too busy to sign up for more! I’m also participating in some challenge. My own one, Flights of fantasy, reread and Rock my TBR (plus the Goodreads challenge) I love the change I’ve seen lately, where people talk about reading older books. They deserve love too :) Good luck and happy reading! I’m only going to do 2 reading challenges, the backlist and goodreads 2016 reading challenge. But I also want to set some goals this year, like read at least 3 debuts or read more classics! I am going to pass on year long reading challenges this year except for the goodreads one. I epically failed last year and I just think a year off is what I need. Good luck with your challenges. They look like a lot of fun!